Performing magic has been a part of my life since I was a schoolboy in the Netherlands, devouring books from the local library. My passion for magic was unrelenting in those early years, and I showed magic tricks to anyone who wanted to see them and in my enthusiasm also to those that were not so interested. I performed in many local talent contests, family birthday parties and some paid performances. My only claim to fame is that I once shared the stage with Hans Klok. He won the first prize at the convention; I was the worst performer. Nowadays I occasionally perform magic as I am more occupied with thinking and writing about the craft. I write books about science and magic and how they relate to each other. Scientists have written a lot about conjuring and magicians use science to create the illusion of magic. 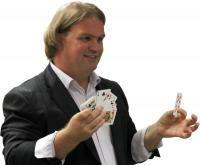 The Magic Perspectives website contains information about my books and magic tricks. Magic Perspectives also includes the most comprehensive bibliography about science and magic. On this website, you can also subscribe to my newsletter to keep up-to-date about future developments. The Box Goes-In-Da Box . A treatise on the Gozinta Boxes. Magicians have been captivated by the Gozinta Box since it was first introduced to the magic world by Lubor Fiedler in 1970. The essence of the gozinta plot in magic is that an object fits into itself - a topological anomaly. The Jastrow illusion is known to magicians as the boomerang illusion. Two boomerang-shaped ring segments seem to be of different sizes but are in fact identical. Magicians tend to underestimate the power of this simple trick. Its use in magic is limited to children's entertainers and magic kits. This illusion is more powerful than it seems at first sight. A recent viral video shows that its deceptive power is as strong as it was when first discovered almost 150 years ago. When watching a magician the question that is most pressing on people's minds is how did he do it? This is not the only question that can be asked of a magic performance. A psychologists might ask why it is possible that the mind can be deceived, occupational therapists are interested in how performing magic tricks can help people with physical disabilities and sociologists research the subculture of magicians.